Looking to increase the number of oohs and aahs you receive this Thanksgiving? Try going the homemade heirloom route by using winter squash instead of canned pumpkin in your pumpkin pies. One of the very best varieties for making pies is Winter Luxury, new at Seed Savers Exchange for 2013. 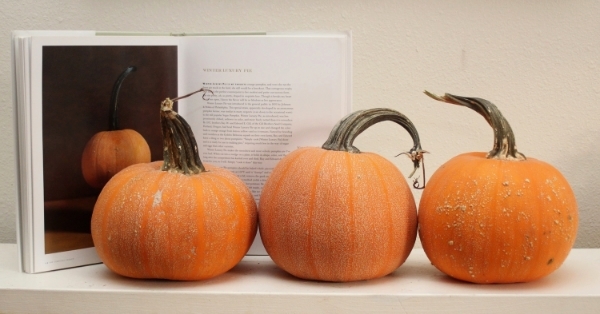 Winter Luxury Squash are featured in Amy Goldman's book, The Compleat Squash. Also known as Livingston’s Pie Squash, Winter Luxury was introduced in 1893 by Johnson & Stokes of Philadelphia. Fruits average 6 pounds, making them the perfect size for two pies. Orange rind is covered in delicate netting; flesh is smooth, sweet, and fiber-free. It's not the best keeper, so enjoy it by Thanksgiving or turn it into squash puree and freeze it until you're ready to use it. Winter Luxury squash are a manageable size for pie making... but it never hurts to have a few on hand to puree and save for later! Winter Luxury should be baked whole, pierced for a few tiny vent holes, stem trimmed. Bake at 350°F until it "slumps" and softens after an hour or so. If you wish, you can cut a lid, remove the gunk and seeds, and replace the lid loosely before baking (this method yields a drier pie). 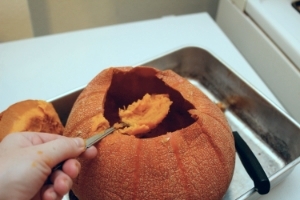 The cooked pumpkin is hotter than hot potatoes: Be careful when you cut out or remove the lid. Seeds and strings, if left inside, come out easily. Take a large spoon and simply scoop the pumpkin out like ice cream. The flesh peels away from the desiccated rind without a shudder and leaves it flat. Puree the flesh in a blender, adding liquid if needed. My standard pumpkin pie recipe comes from my Grandma Ivah Babcock. It's a family heirloom just as Winter Luxury squash is a garden heirloom. Mix pumpkin puree, sugar, salt, and spices. In a separate bowl combine eggs, milk, and evaporated milk. Pour into pie crust. Bake for 50 minutes or until the center of the pie has begun to set. The pie will continue to set as it cools to room temperature. As a side note, some people dislike the moist bottom crust of pumpkin pie. One method for a drier, crisper crust is par-baking. Prepare your crust as usual. Line it with parchment paper or tin foil. Fill it with pie weights, pennies, or my personal favorite—dry beans. I keep a large jar of True Red Cranberry beans around for this purpose. Keep in mind that once you have used beans as pie weights, you won't want to eat them. All of the moisture has been baked out! Bake the crust for 10 minutes, then remove the weights and parchment (CAREFUL! They're hot!). Bake the crust for 5-10 minutes more until the crust is golden brown. Then add your pie filling to the warm crust and bake as directed. Since you have already baked the crust, you will want to cover the rim with foil or a pie crust guard to keep it from burning as the pie filling bakes. Voila! The ultimate in heirloom cookery! Seed Savers Exchange offers many varieties of squash in its online store, some of which are excellent for baking.